We kicked off the Easter Bank Holiday weekend today by venturing to the McArthurglen Outlet village in Bridgend for some much needed retail therapy. True to form however, we didn’t get much therapy – other than some chocolate from the Cadbury shop and a bargain bucket from KFC for lunch. Diet, what diet? The highlight of the day – for DDWT Junior at least – was our participation in the outlet’s Easter Bunny Hunt. This simply involved the kids spotting 10 pink or blue Easter bunnies (which were strategically positioned in various shop windows) and filling in the appropriate shop name on their entry form. All completed entries would get a prize – super smashing great we thought. We found all 10 bunnies whilst meandering our way around the shops and then proceeded to get DDWT Junior’s prize from the information desk. 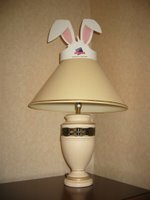 The missus and I were a little perplexed though to find that the prize was a McArthurglen bunny hat and some champagne truffles from Thorntons – yes I did say champagne truffles. Now don’t get me wrong, it was a nice idea – but me thinks a nice little Easter egg for the little ‘uns would have been a better bet than champagne truffles! We did have a good old laugh about it on the way home though – after eating the truffles of course. 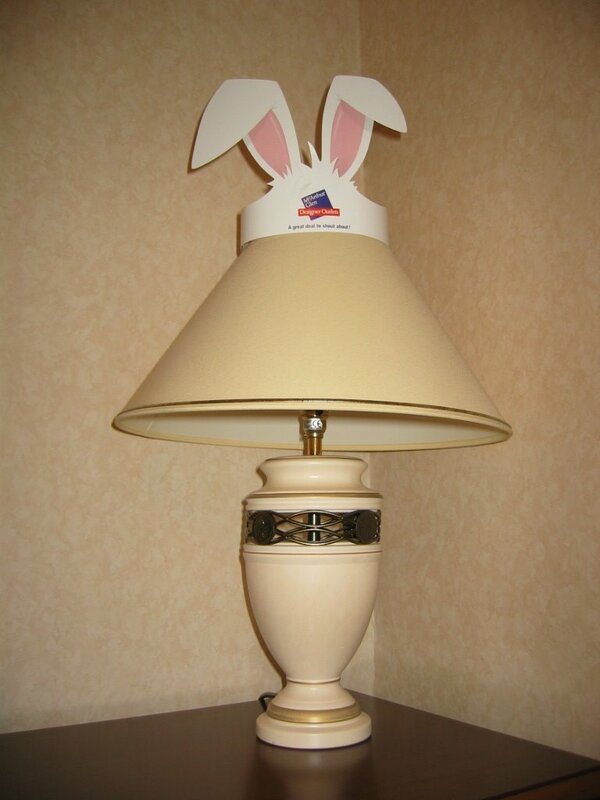 Shown below is a picture of the McArthurglen bunny hat being worn proudly by our living room table lamp. It’s not been a good week to date on the training front. It seems that sleep deprivation and work have conspired to prevent me from doing anything *big sigh*. I’ve not helped matters either by eating junk food (chocolate and chips in particular) like it’s going out of circulation. So to say that I’m not looking forward to Sunday’s weigh-in is a bloody understatement.